Across the nations, a stellar line-up of artists entertain audiences with a mix of classical, jazz and contemporary repertoire to celebrate the Last Night of the Proms. 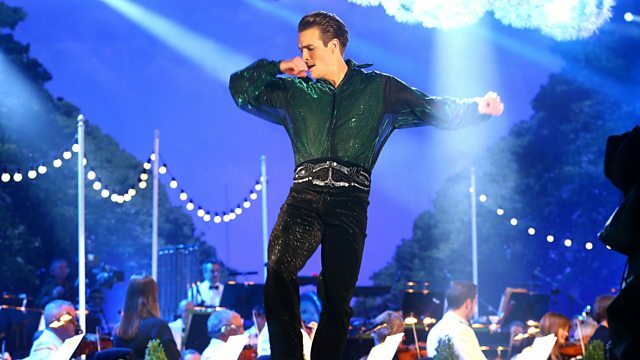 Across the nations, a stellar line-up of artists entertain audiences with a mix of classical, jazz and contemporary repertoire to celebrate the Last Night of the Proms. Presenter Josie d'Arby joins the party at Titanic Slipways in Belfast, where Riverdance are among the artists entertaining the crowd. X Factor winner Alexandra Burke takes to the stage in Glasgow, while in Swansea the internationally-acclaimed operatic soprano Rebecca Evans joins West End star Luke McCall. And topping the bill in Hyde Park are American music legends the Jacksons. Orchestra: Ulster Orchestra. Conductor: David Brophy. Performer: Lucy O'Byrne. Orchestra: BBC National Orchestra of Wales. Conductor: Gareth Jones. Performer: Rebecca Evans. Orchestra: BBC Concert Orchestra. Performer: Alison Balsom. Orchestra: BBC National Orchestra of Wales. Conductor: Gareth Jones. Performer: Alexander Bone. Orchestra: Ulster Orchestra. Conductor: David Brophy. Performer: Charlie Siem. Orchestra: BBC Concert Orchestra. Performer: Danielle de Niese. Orchestra: Ulster Orchestra. Conductor: David Brophy. Performer: Noah Stewart. Orchestra: BBC National Orchestra of Wales. Conductor: Gareth Jones. Performer: Luke McCall. Orchestra: BBC National Orchestra of Wales. Conductor: Gareth Jones. Orchestra: BBC Scottish Symphony Orchestra. Conductor: Stephen Bell.